For years now, I have been so used to Ray-Ban's #NeverHide campaign that it seemed absolutely bizarre to me that they would even think of changing it. 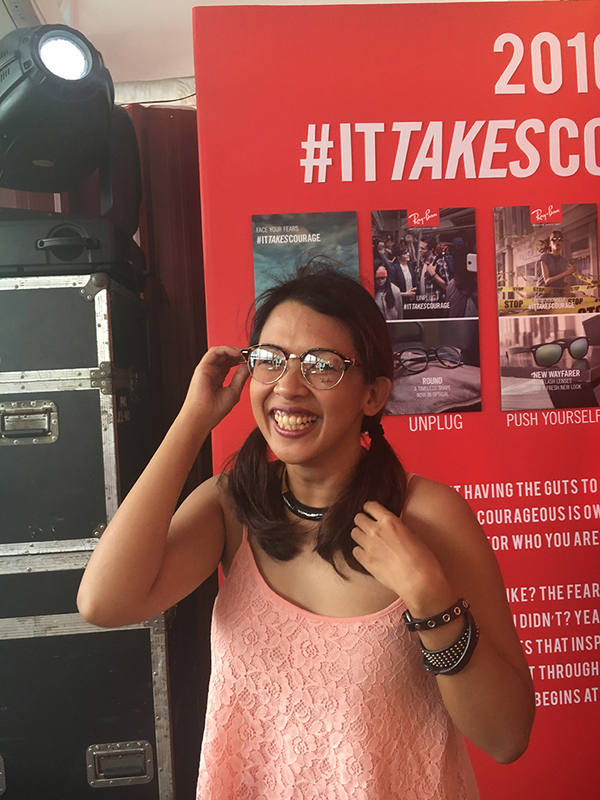 After attending their #ItTakesCourage event last week, though, I don't just understand why they did it; I absolutely love that they did. There were cute Ray-Ban scooters. A display of all of the different Ray-Ban styles. Ely Buendia providing the live music. They also had an open bar! Score! Heck, they even had free portraits and free (yes, free!) tattoo sessions - real ones, not Henna ones. Of course, their amazing sunglasses were also on display and ready for anyone to try on and take pictures with. I never noticed until then that all of the iconic movie stars wearing glasses all wore Ray-Ban styles! And now… back to the campaign. Now, you've probably seen the many posters of Ray-Ban's Never Hide campaign - colourful pop art that exuded the carefree spirit of Ray-Ban and their love and encouragement of individuality. They eventually moved from pop art to real life situations where people truly stood out and, as mentioned, I loved everything about the message of that campaign. However, there is much to love about the new campaign, too. The It Takes Courage campaign doesn't actually replace the Never Hide campaign, but instead builds on it. Instead of just being yourself, why not take things up a notch by being courageous and stepping out of your comfort zone? Face your fears and do something you've always wanted to do. Unplug from your devices and actually talk to people. Fight perfection, speak your mind and stand for what you believe in. I'm a huge fan of Ray Ban products. I actually have collection of eyeglasses and now I'm planning to buy a Ray Ban scooter for my son.